There are many reasons why women love jewellery. They can be amazing accessories to complement an outfit, a symbol of love, or even represent a milestone or moment in their lives that they want to keep close and dear to them. Flowers are romantic gestures, and the Flower Jade Studs in 9KT solid gold takes it to a whole new level. 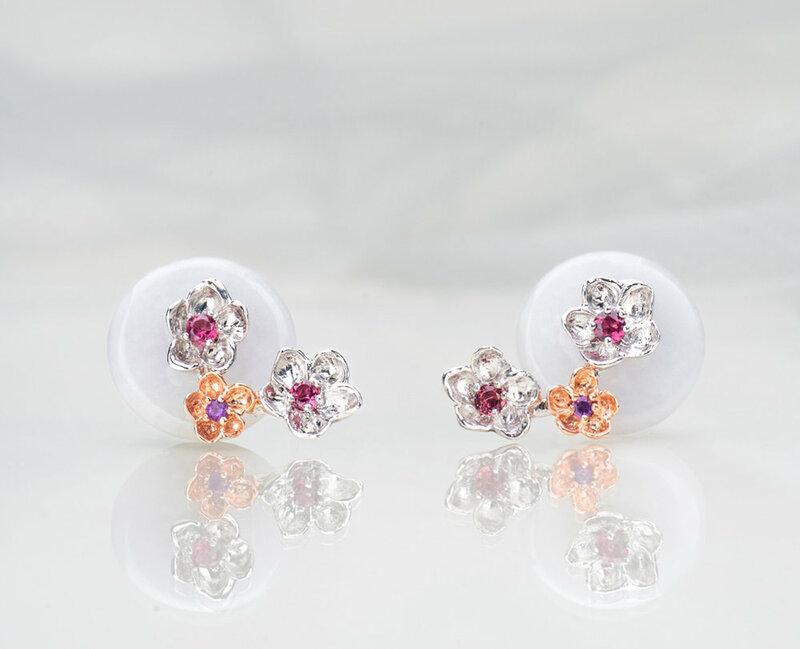 This pair of studs features a main gemstone of your choice with a lovely Camellia flower motif at the side – a symbol of devotion among lovers. It is said that the Camellia flower's petals reflect the virtues of a lady. Top that off with a selection of coloured and symbolic gemstones ranging from moonstones to amethysts, the Flower Jade Studs say 'I Love You' like never before. It's hard to imagine how different life would be without a mother's love and sacrifice. Her love for you is undisputed by all, so be sure that she and everyone else knows just how much you love her with a statement necklace that will not go unnoticed. The Cherry Blossom Branch Necklace in 9KT solid gold features ornate blooms adorned with gemstones together with our signature jade. The classic and feminine design of the jade necklace makes it a versatile accessory that matches any outfit for any occasion. To the wonderful lady that raised the finest daughter or son you now call your wife or husband, she deserves to be showered with love and gifts. The dreamiest of emerald green Jadeite beads were especially chosen for the Aura Jade Studs, set in stunning 18kt rose gold with an original Choo Yilin designed floral backing. In simplicity lies elegance; this is a timeless gift suitable to be worn by all ages. Throughout Asian history, jadeite has been a precious way to gift loved ones. Choo Yilin reinterprets traditional jade bangles into contemporary jewellery pieces that are versatile for important occasions and day-to-day wear. As jade jewellery is filled with heritage and meaning, they are wonderful as wedding gifts, and make beautiful heirloom jewellery pieces that can be passed down. 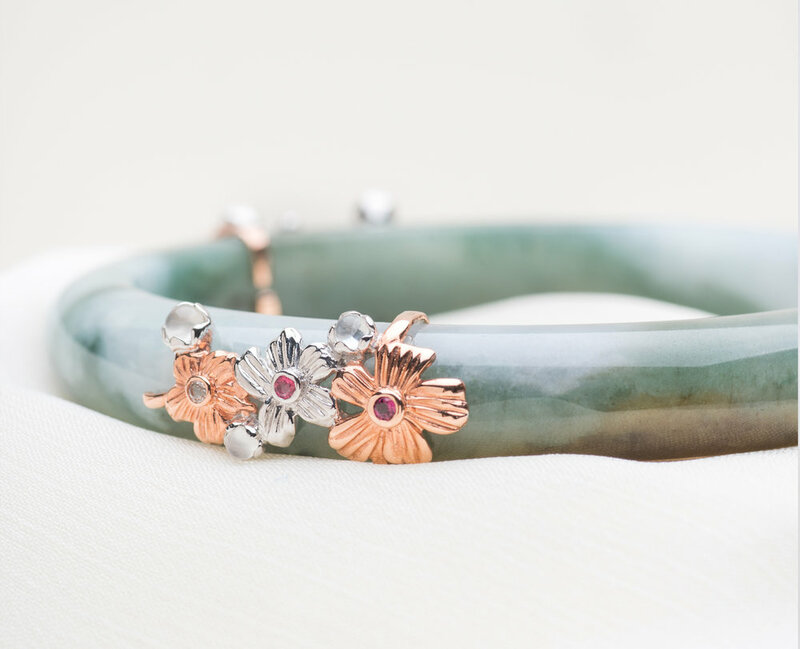 Without a doubt, your daughter will treasure this Sakura Jade Bangle and perhaps even pass it down to her own daughter in the future. The best partner-in-crime in your younger years (or maybe even now) and the one person who knows all your embarrassing secrets of your growing years, your beloved sister is probably one of the first loved ones on your Christmas shopping list. But really, what would we do without amazing sisters who can be counted on whenever the time calls for it. The pair of beautiful Sakura Florette Jade Studs in 9KT solid gold sums up your loving relationship with your sister, representing preciousness, and how she will always, always have your back. Remember the friendship bands you used to exchange with your best friend? As precious as those bands were, there’s nothing quite like a string of pearls to strengthen your friendship and to thank her for always being there through thick and thin. After all, pearls are symbols of purity, innocence and love - virtues of great friendships that go a long way back. Featuring freshwater pearls, the Peranakan Lace Pearl Bracelet in 9KT solid gold is worthy of celebrating life’s most special moments and people.